Ram Gopal was one of the most important dancers of the 20th century and certainly one of the most exotic theatre performers. He was a major figure in the revival of Indian dance and his spectacular theatrical presentations introduced it to audiences both in Asia and the West. He was proud of the authenticity of his music, costuming and style, shrewdly tailored his presentations to Western audiences, using modern theatrical techniques and spectacular presentation. This headdress was worn by Gopal in the Dance of the Setting Sun and Lord of Shiva dances. Shiva is the Hindu God of destruction and the headdress is copied from Indian sculptures and reliefs. It is clear, from the style and the jewels, that it was made in India. Unlike many of Gopal's costumes, this is not a design reinterpreted for Western audiences, but is a spectacular and beautiful example of an original Indian dance costume. Most theatrical costumes are subjected to considerable wear and tear, not just in performance but in the constant packing and repacking as the company moves from one engagement to another. Repairs have to be carried out where possible using whatever replacements are to hand. In this headdress, stones and pearls have been replaced with others clearly not of Indian origin, and some of the hanging pieces are missing. Kathak flat crowned headdress of magenta silk base mounted on stiffening, overlaid at the back with a lattice of gold sequins between which are sequin 'flowers' held by gold metal cord each with a coloured 'jewel' at the centre (some missing); the back rises to a peak and curved down at lower edge. The front band is decorated with a zig-zag of gold sequins, within each of which is a 'flower' or large gold sequins centred with a coloured 'jewel' and surrounded by 'foliage' in gold metal braids and cords; above this to either side is a similarly decorated band topped by a high fan-shape, each 'leaf' outlined in blue jewels and gold metal cord and filled in with gold metal braids and cords. Over the front band is a bold horned motif of 'jewels' in metal setting, linked by wire to a smaller motif at the head of the 'fan'; both motifs have hanging green ribbed beads and the 'fan' also has 'leaves' in red sequins and beads. To either side of the headdress are fixed bold motifs similarly constructed with hanging floral pendants. The headdress is lined with brown velvet. Through the years, additional hanging pieces have fallen off the main headdress. The pearls and red, green and blue stones encrusted on the headress were made in India. 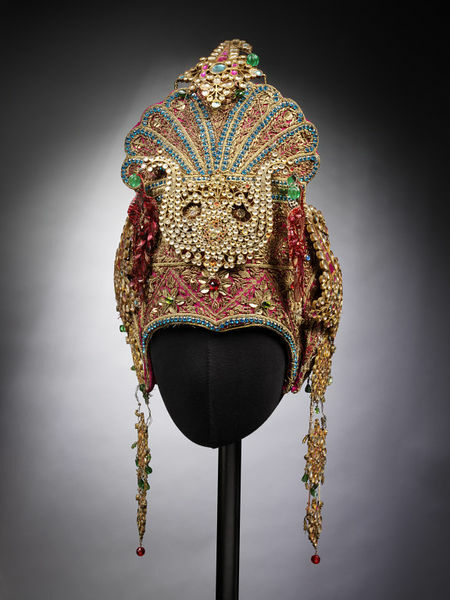 Headdress worn by Ram Gopal in his "Lord of Shiva" dances. In design, it resembles the Hindu god Shiva's headdress. The pearls and red, green and blue stones encusted on the headress were made in India. Some additional hanging pieces are missing. 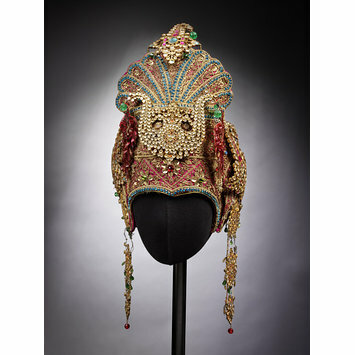 The headdress is an original Indian dance costume, made in India and not reinterpreted for Western audiences. It was was probably worn with arm bracelets S.113:1 to 2-2004. Ram Gopal (1917-2003) and Uday Shankar, were the most important Indian dancers of the 20th century. Gopal built on Shankar's pioneering revival of Indian dance and its introduction to audiences both in Asia and the West, taking it one stage further. He remained faithful to the pure discipline, technique and ethos of Indian classical. but he also started to open out a deeper appreciation of Indian classical dance traditions, shrewdly tailored to Western audiences, using modern theatrical techniques and spectacular presentation. He widened audiences experiences by including music and other folk and classical styles alongside his own pieces. Each item was preceded by an explanation, enabling audiences to understand and appreciate what was, at that time, a very esoteric art form. For three decades he was a major world star, with a glamour and charisma equal to any other major dance star of the period. He not only raised public awareness of the richness of Indian dance but worked with dancers trained in other dance forms, like Alicia Markova, thus setting a precedent in Britain for the current thriving and creative South Asian dance scene, which mixes classical Indian dance with other contemporary and classical dance styles to create something uniquely itself. Each of Gopal's costumes was hand made and tailored to his own design. He spent huge sums on his costumes, which could be insured for as much as £25,000. Some were made of cloth of gold, woven and tailored in India; when it became worn, it was sent back to India, melted down and rewoven. Costume worn by Ram Gopal in Dance of the Setting Sun and Lord of Shiva dances, mid-20th century.